Perhaps the only solace of flying on a commercial airplane -- sitting by yourself in a hermit's shell and slowly sinking into a reclusive, introspective haze -- is under assault by Southwest Airlines. The carrier is revamping its in-flight entertainment offerings with the promise of live musical performances on some of its flights, rendering you party to a captive audience as you traverse the skies. Southwest's partnership with Warner Music Group Nashville has existed since 2011, but the program is set to expand under the new agreement, according to a Billboard report. This means the airline's Live at 35 concert series, which sees WMN artists perform pop-up concerts on its airplanes, has a higher likelihood of subjecting you to a country concert that you didn't ask for. 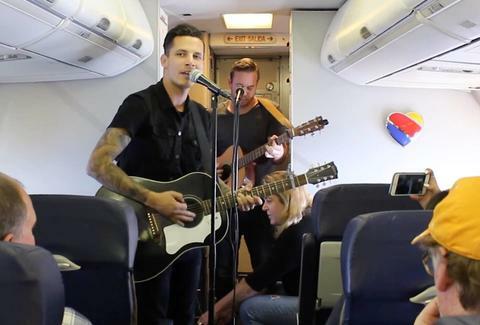 In an attempt to drum up excitement about the new feature, Southwest teamed with WMN artist Devin Dawson to serenade passengers onboard a recent flight from Nashville to Philadelphia. Dawson's performed his debut single "All Of Me," and more than likely interrupted a few naps with his acoustic ballad. While you'll still be able to choose your seat on a Southwest trip -- and try to remain calm as inevitable turbulence jostles your pressurized metal vessel -- the possibility of a live, in-flight concert probably won't have you too excited. But then again, maybe you're a masochist. Just remember not to clap when the plane lands.